December 1937. 'Thunderbolt' 312.30 mph on Bonneville Salt flats. December 1937. 'Speed of the Wind', with front wheel drive and holds 4 world and 3 international records. Has a Rolls Royce aero type engine. Set the diesel record at nearly 160 m.p.h. Eyston was Captain of the 1st Trinity Boat Club while he was at Cambridge and raced motor-boats for a year in 1925, and played a prominent part in both World Wars. 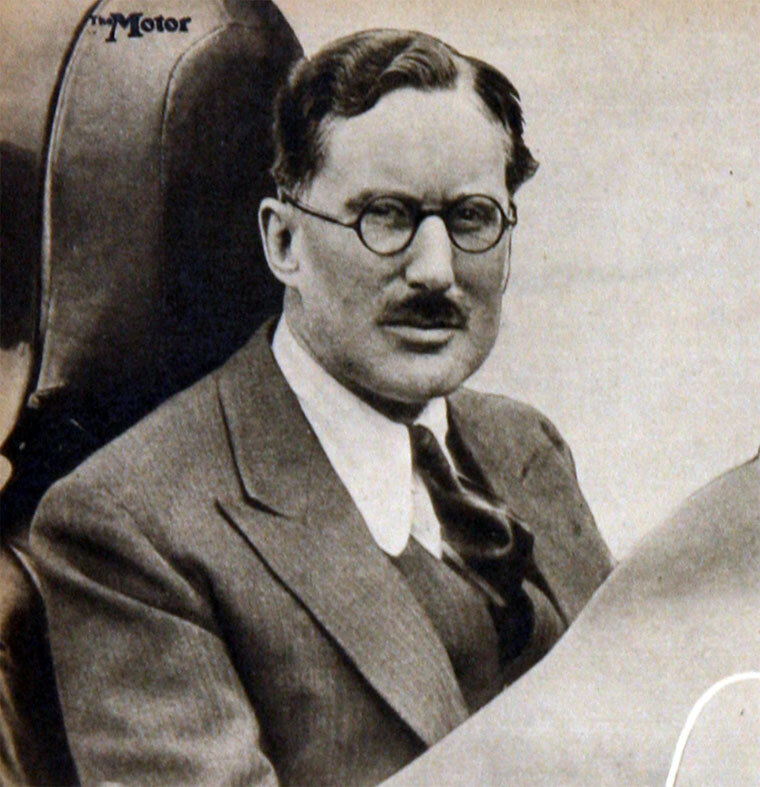 Captain George Edward Thomas Eyston, MC OBE (28 June 1897 - 11 June 1979) was a British racing and land speed record car driver in the 1920s and 1930s. His racing career began with European road races, particularly in Bugattis, with success in races such as the 1921 and 1926 French Grand Prix. Later he was particularly well-known for driving supercharged MGs, such as the Magic Midget and the K3 Magnette. Eyston was also a noted racer of MGs, particularly his K3 Magnette in the 1933 Isle of Man and 1934 Northern Ireland Tourist Trophy races and the Mille Miglia. Always one with an eye for any obscure record that he could capture, he fitted a diesel engine from an AEC bus into a Chrysler car chassis and used it to set high-speed endurance records. First in 1933 reaching 100.75 mph at Brooklands, then 106 mph in 1936. Unusually for a "racing" car, this endurance record-setter was equipped with saloon bodywork, a roof, a full windscreen and even windscreen wipers. In 1935, he was one of the first British racers to travel to the Bonneville salt flats of Utah, with his 24 & 48 hour record-setting car Speed of the Wind. He is best known today for land speed records set in his car Thunderbolt. 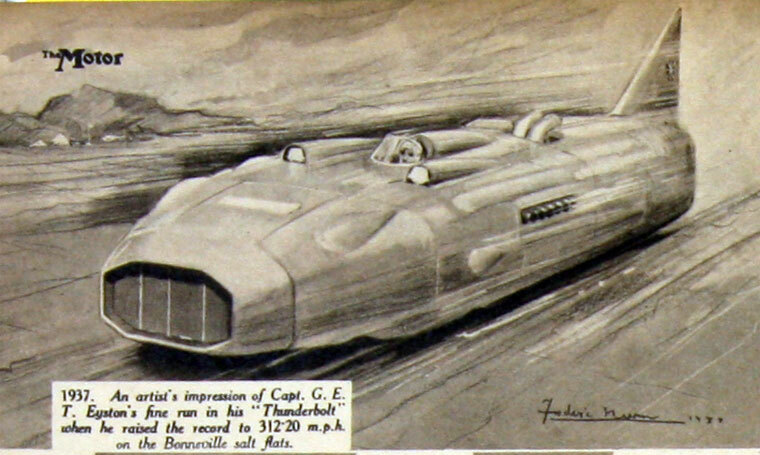 Between 1937 and 1939 he set three new land speed records taking over from Malcolm Campbell's Bluebird, but was twice bettered by John Cobb. 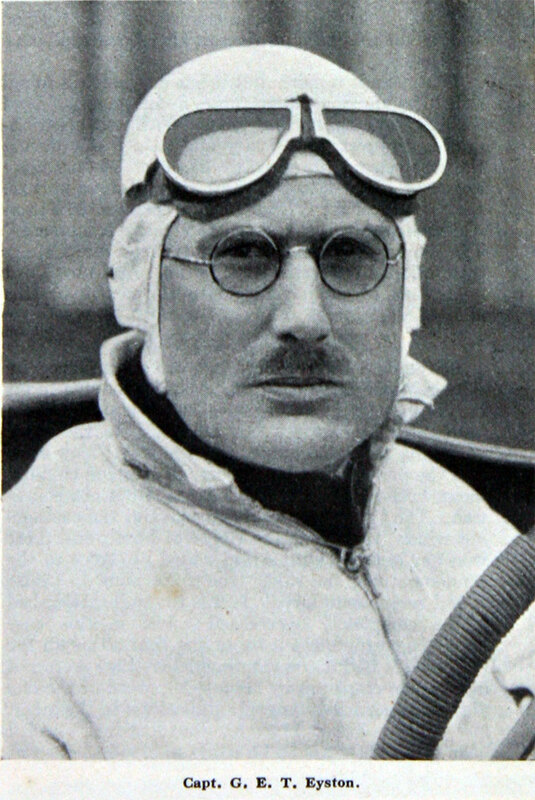 The rivalry was friendly though, and in later years Eyston, as competitions manager for Castrol, assisted with Cobb's ill-fated attempt on the water speed record in Crusader. Although prominent in his day, history has rather overlooked him and he is far less well known today than the Campbell dynasty, or even John Cobb. As well as racing, he was also an engineer and inventor, with a number of patents related to motor engineering and particularly supercharging. His work on developing high-power gearboxes was important for Thunderbolt, along with his invention of the Powerplus supercharger used on MGs.